Peach Pastries with Dulce de Leche Filling (persiki): elegant but tender dulce de leche filled cookies, topped w/ carrot & beet juices. 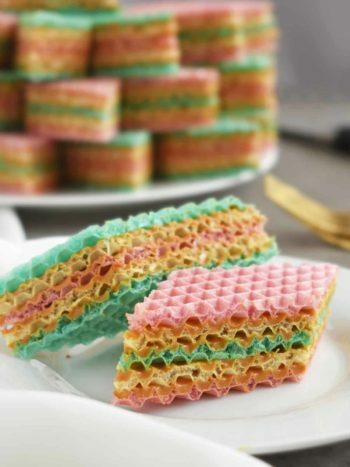 These cookies are a must for major holidays! 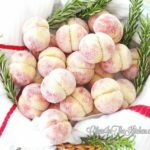 These beautiful Peach Pastries are usually made around major holidays such as Christmas and Easter or different celebrations such as weddings. 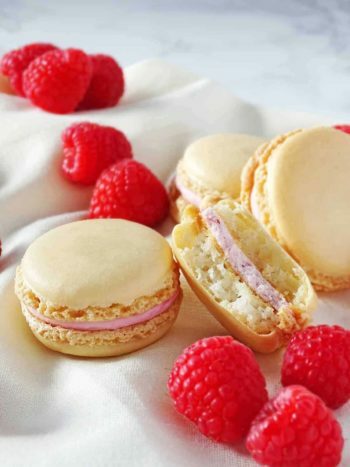 Their appearance play a major role at the desserts table. However, there is no rule that you cannot make these any day of the week and any time of the year; at least that’s true in my family 😀 . Even though these are called peaches and look like peaches, they taste nothing like the fruit peaches. In fact, these are better! These are slightly time consuming, but so easy to make. Decorating with color takes the longest time. You can also east them without decorating, but I ALWAYS make them from start to end, even if it’s just for me, my husband and our kids. We like to eat pretty things too 😀 The cookie itself is a bit harder on the outside, but tender when you bite into it and the dulce de leche cookie crumbs filling is to die for. 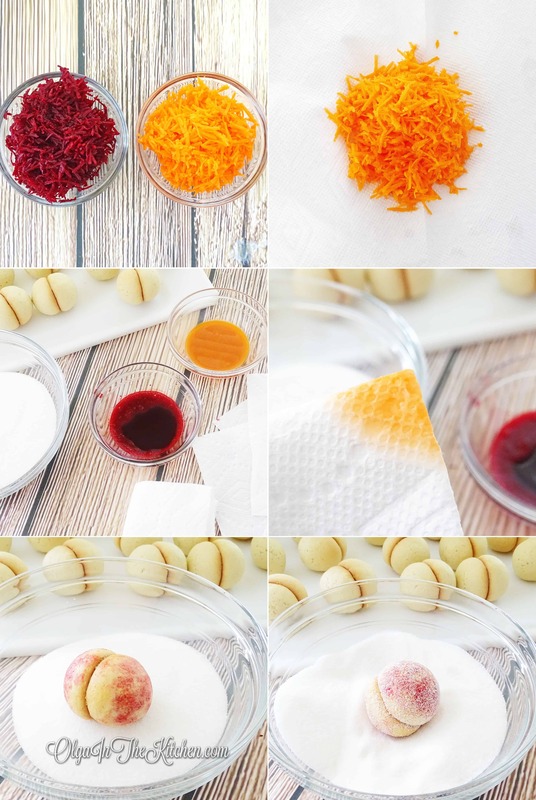 Decorating the cookie with carrot and beet juices and dipping into sugar make these pastries so elegant and so eye catching. If you’re making one than one serving, mix each serving separately for best results. 1. Preheat oven to 350 degrees F. Lightly oil nonstick cookie sheet; set aside. In a medium bowl, beat 2 large eggs and 1 cup sugar on high for 1 1/2 – 2 mins maximum until sugar dissolved a bit. 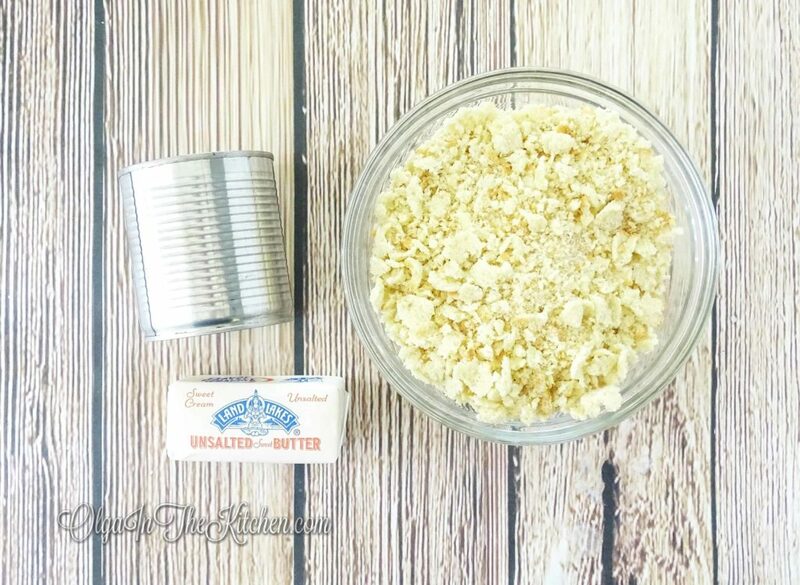 Add 4 tbsps unsalted room temp butter, 2 tbsps sour cream and 1/4 tsp vanilla extract and continue beating on high for another 1 minute just until everything mixed in (don’t worry about little butter clumps). 2. 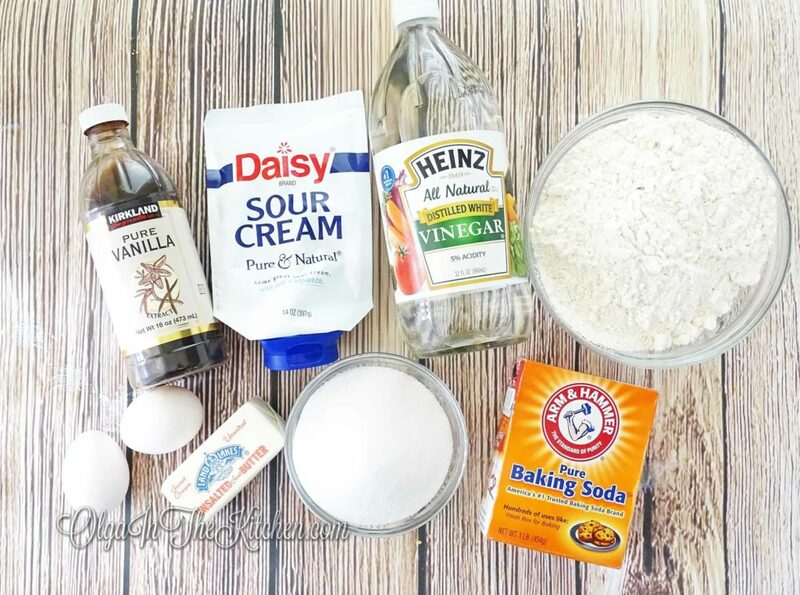 In a small bowl, combine 1/2 tsp baking soda and 1 tsp vinegar; stir to fizz. Pour this mixture into the batter and mix until well blended. Sift about 1 cup flour into the batter and beat on low until mixed in. Once the butter starts to get thick, sift the other remaining (total 3 or 3 1/4 cups) flour and finish dough with hands. 3. Lightly oil large cutting board and thin cutting knife (dip paper towel into oil and wipe knife with oily towel). 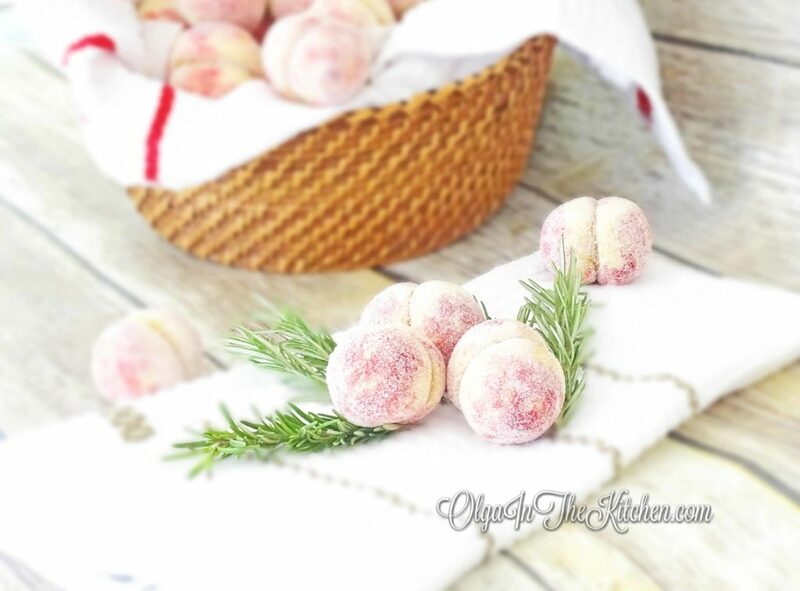 With your hands, form balls about 1 1/2” in diameter and place onto cutting board. You will have about 25-26 balls. With oily knife, cut each ball into half (wipe off knife with oiled paper towel every 5-6 balls so that knife goes in smoothly without dragging the dough). Transfer the cookie halves onto baking sheet 1-2” apart and press edges of each cookie half with your fingers to make it more round rather than square (if needed). Bake for 13-15 minutes until you start seeing gold-ish on bottoms. When the time is up, remove baked cookies from baking sheet so they don’t continue baking and become too dry. 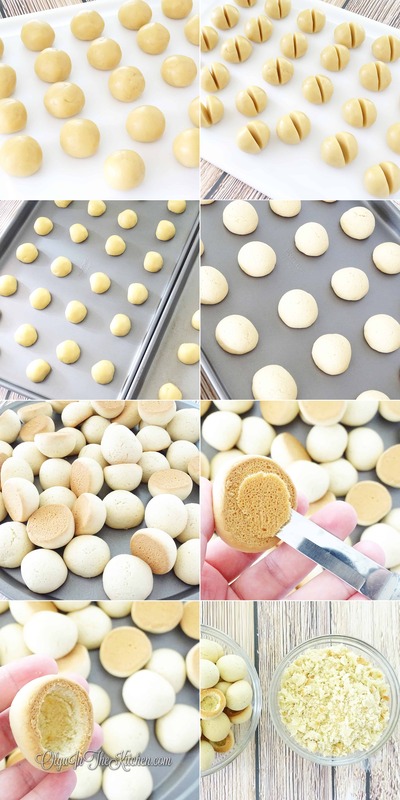 Using a small knife, very gently (to prevent cookie from breaking) cut out a circle from the center of the bottom of each cookie, leaving a small border on the outside; scoop out the center and save the cookie scraps in a medium bowl as you will need them later for filling. 4. In a medium bowl, combine and beat 1 can dulce de leche with 4 tablespoons room temp unsalted butter until there are no butter lumps. Crumble the reserved cookie crumbs and scraps with your hands and stir together half of it with dulce de leche mixture until it comes together (just enough so that cookie scraps don’t fall apart, but not too runny either). Find a pair for each cookie half before you start filling. Using a dull round tip kitchen knife (or a similar gadget), fill the scooped out center of the cookie by spreading and filling plain dulce de leche half way (make sure to get the sides well) and complete with cookie scraps/dulce de leche mixture just until the cookie is filled and flat. 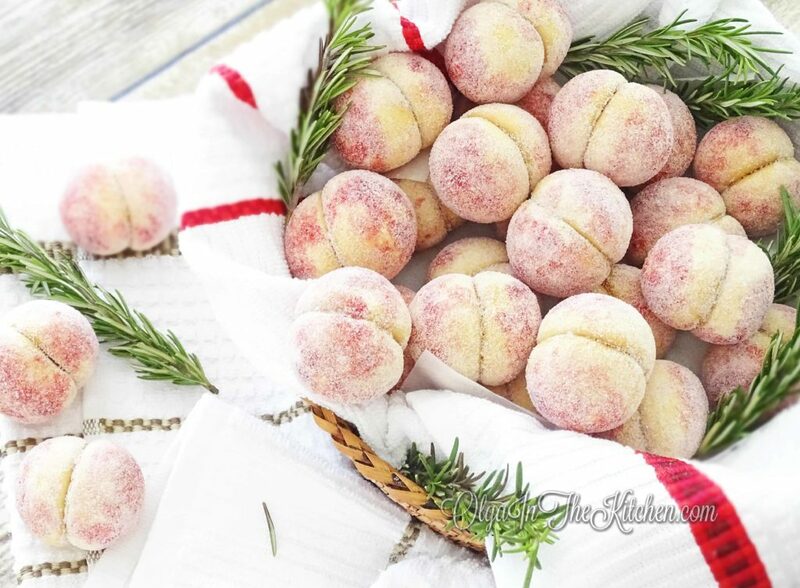 Repeat for the other cookie and gently press two of the filled cookies – filling sides together to make a peach pastry. 5. Peel, wash and grate 1 medium carrot and 1 medium beet onto a small hole. Transfer grated carrot onto a paper towel (Brawny, Bounty or Viva Vantage brands work the best); gather paper towel edges together and gently squeeze the grated carrot in your hands to let out any juice into a clean small bowl. Repeat for the grated beet. (I got about 1 tbsp juice from each, which is more than enough). Add and whisk 1 drop (1/8 tsp) vanilla extract into carrot juice and 1 drop vanilla extract into beet juice. You’ll need about 6-8 small squares of paper towel (Brawny, Bounty or Viva Vantage). Lightly dip the towel corner into carrot juice and tap-tap-tap the peach cookie anywhere and anyway you like. With second piece of paper towel, dip into beet juice and again tap-tap-tap the peach cookie to finish, giving it a peach design. (DO NOT DIP PEACH INTO CARROT OR BEET JUICE unless you like them all soggy). Sugar dip right away before carrot/beet dry out and transfer into a serving bowl or plate. 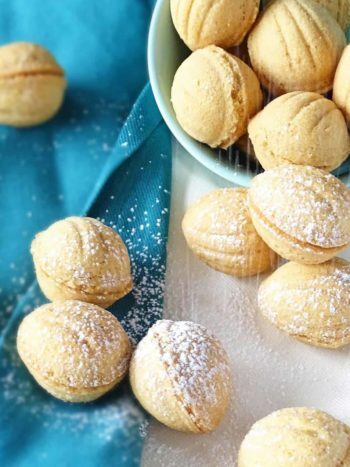 Keep these at room temperature at least for few hours so they absorb dulce de leche and become soft. (It’s okay to continue keeping these at room temp if you prefer for couple days, otherwise refrigerate). Enjoy!! 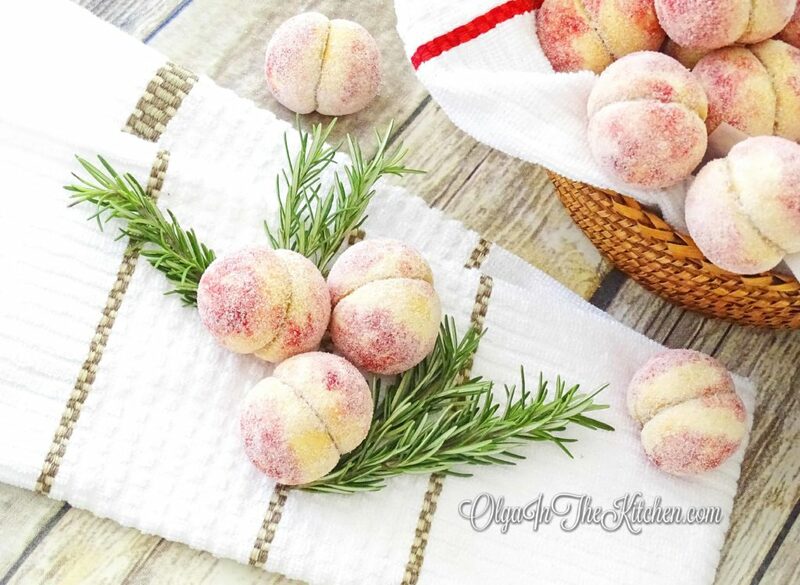 Peach Pastries with Dulce de Leche Filling (persiki): elegant but tender dulce de leche filled cookies, topped with carrot and beet juices and dipped into sugar. Preheat oven to 350 degrees F. Lightly oil nonstick cookie sheet; set aside. 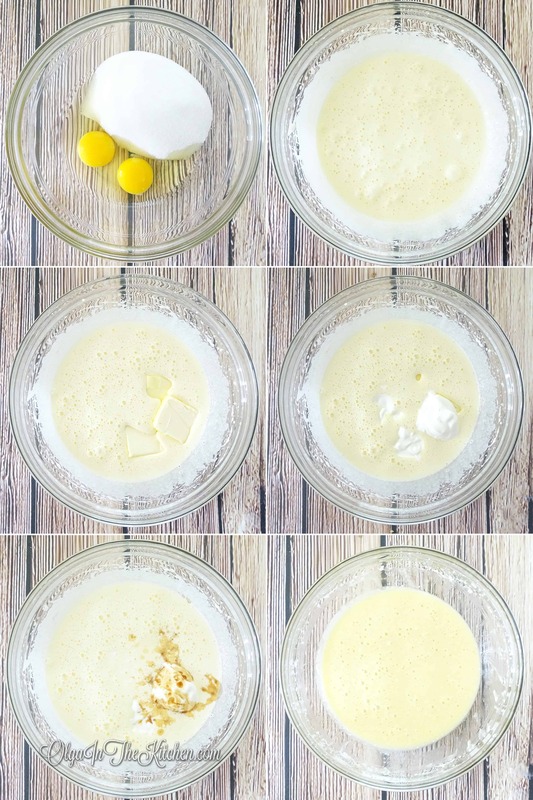 In a medium bowl, beat 2 large eggs and 1 cup sugar on high for 1 1/2 – 2 mins maximum until sugar dissolved a bit. Add 4 tbsps unsalted room temp butter, 2 tbsps sour cream and 1/4 tsp vanilla extract and continue beating on high for another 1 minute just until everything mixed in (don’t worry about little butter clumps). In a small bowl, combine 1/2 tsp baking soda and 1 tsp vinegar; stir to fizz. Pour this mixture into the batter and mix until well blended. Sift about 1 cup flour into the batter and beat on low until mixed in. Once the butter starts to get thick, sift the other remaining (total 3 or 3 1/4 cups) flour and finish dough with hands. Lightly oil large cutting board and thin cutting knife (dip paper towel into oil and wipe knife with oily towel). With your hands, form balls about 1 1/2” in diameter and place onto cutting board. You will have about 25-26 balls. With oily knife, cut each ball into half (wipe off knife with oiled paper towel every 5-6 balls so that knife goes in smoothly without dragging the dough). Transfer the cookie halves onto baking sheet 1-2” apart and press edges of each cookie half with your fingers to make it more round rather than square (if needed). Bake for 13-15 minutes until you start seeing gold-ish on bottoms. When the time is up, remove baked cookies from baking sheet so they don’t continue baking and become too dry. Using a small knife, very gently (to prevent cookie from breaking) cut out a circle from the center of the bottom of each cookie, leaving a small border on the outside; scoop out the center and save the cookie scraps in a medium bowl as you will need them later for filling. 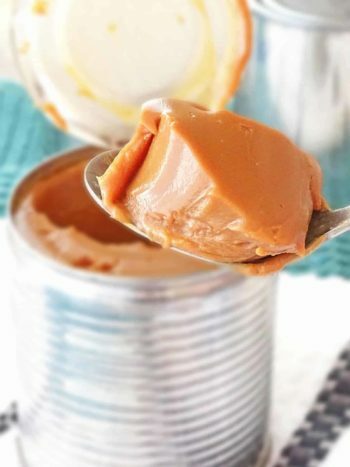 TO MAKE THE FILLING: In a medium bowl, combine and beat 1 can dulce de leche with 4 tablespoons room temp unsalted butter until there are no butter lumps. Crumble the reserved cookie crumbs and scraps with your hands and stir together half of it with dulce de leche mixture until it comes together (just enough so that cookie scraps don’t fall apart, but not too runny either). 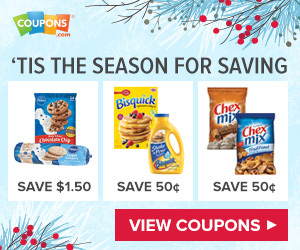 Find a pair for each cookie half before you start filling. Using a dull round tip kitchen knife (or a similar gadget), fill the scooped out center of the cookie by spreading and filling plain dulce de leche half way (make sure to get the sides well) and complete with cookie scraps/dulce de leche mixture just until the cookie is filled and flat. 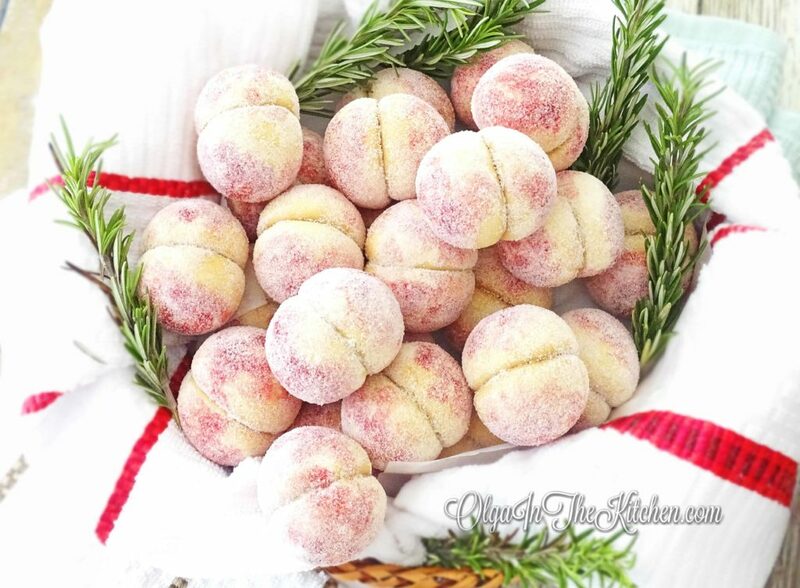 Repeat for the other cookie and gently press two of the filled cookies – filling sides together to make a peach pastry. DECORATING PEACHES: Peel, wash and grate 1 medium carrot and 1 medium beet onto a small hole. Transfer grated carrot onto a paper towel (Brawny, Bounty or Viva Vantage brands work the best); gather paper towel edges together and gently squeeze the grated carrot in your hands to let out any juice into a clean small bowl. Repeat for the grated beet. (I got about 1 tbsp juice from each, which is more than enough). 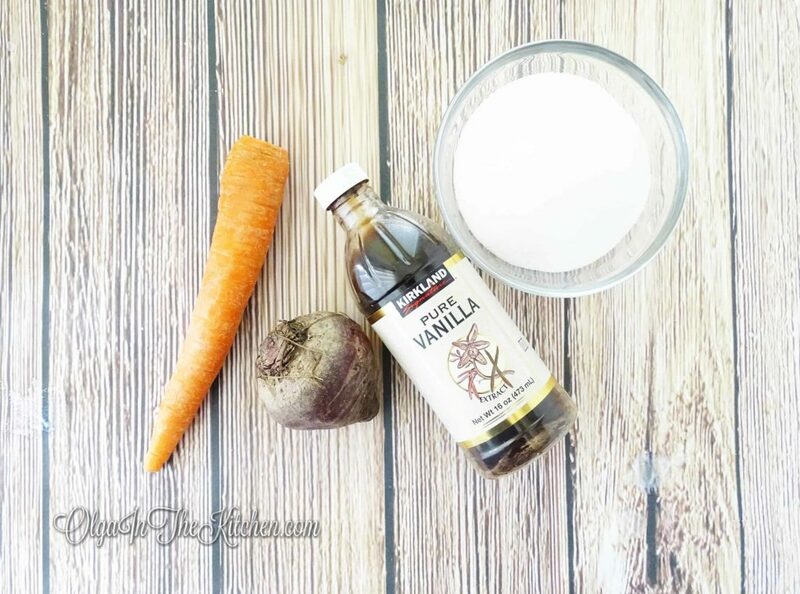 Add and whisk 1 drop (1/8 tsp) vanilla extract into carrot juice and 1 drop vanilla extract into beet juice. Next, you’ll need about 6-8 small squares of paper towel (Brawny, Bounty or Viva Vantage). Lightly dip the towel corner into carrot juice and tap-tap-tap the peach cookie anywhere and anyway you like. With second piece of paper towel, dip into beet juice and again tap-tap-tap the peach cookie to finish, giving it a peach design. (DO NOT DIP PEACH INTO CARROT OR BEET JUICE unless you like them all soggy. I personally prefer these pastries to look elegant and neat instead of mushy looking). Sugar dip right away before carrot/beet dry out and transfer into a serving bowl or plate. Keep these at room temperature at least for few hours so they absorb dulce de leche and become soft. (It’s okay to continue keeping these at room temp if you prefer for couple days, otherwise refrigerate). Enjoy!! I love this recipe. All this time I thought there’s some special mold needed to make them, and since there’s no mold, this is one beautiful addition to a table. Come Thanksgiving and Christmas, oh my it will be so popular! These little beauties became staple in my house. For every holiday, birthday, party. I even made them on Tuesday last week, no special occasion. Kids keep asking me to make them all the time, they are so good.